Employee morale and productivity are both inextricably tied to the quality of the space that they work in each day. 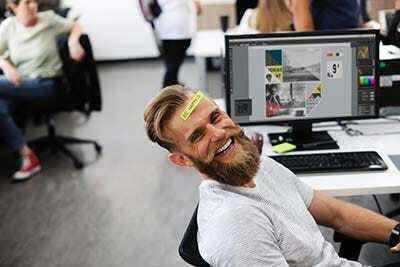 In fact, research shows that employees who are content in their workspace are far more likely to be satisfied with their jobs, and are nearly twice as productive as those who are unsatisfied with their working conditions. Below, we explore the correlation between employee morale, productivity, and the workspace, and offer simple tips that employers can implement in order to keep their employees satisfied in their physical workspace. Companies like Facebook and Google spend millions of dollars each year to improve the work environment for their employees, and it’s not hard to see why. Even for the most motivated employees, working in an unoptimized workspace can prove to be a detriment to morale and productivity. After all, if you spend 8-10 hours a day at work each day; your mood and demeanor are likely going to be affected by your immediate work surroundings. Employees are generally happier when they work in a pleasant, clean, comfortable environment that has also has space for them to decompress from their day-to-day tasks. Is the office clean? Do employees have comfortable places to sit and accomplish their work? Do they have the tools necessary to achieve their goals? Do their computers work? Is there a place for them to relax after a stressful call or meeting? Do they have places to meet with coworkers to brainstorm? Questions like this become increasingly important when it comes to employee morale. 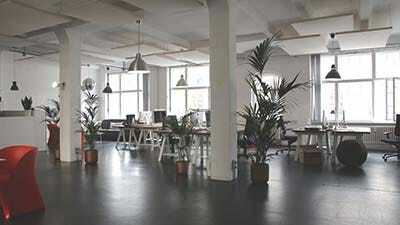 The physical office space doesn’t just affect employee morale. Research shows that employees who content in their workspaces are also more productive. In an experiment, Tom DeMarco and Timothy Lister had 600 software developers at 92 different companies complete a series of benchmark coding and testing tasks in a test they called the “Coding War Games.” Each participant worked individually and logged the amount of time they spent working. Their performance was evaluated by a number of criteria, but it was found overall that the best programmers outperformed the worst by a ratio of 10 to 1. When compared to average programmers, the best performers still outperformed their peers by a ratio of 2 to 1. The reasons for their superior performance could be attributed to a number of things. DeMarco and Lister were surprised to discover that there was almost no correlation between salary and performance, nor was there a direct correlation between years of experience and superior performance. Instead, what DeMarco and Lister found was that those who are more satisfied with their workspace were more likely to excel in their work and were overall far more productive. DeMarco and Lister’s study indicates that environmental factors, such as noise levels, privacy, the frequency of distractions and interruptions can all have a significant impact on employee productivity. “[The experiment] clearly shows that the participants who performed in the top quartile had much more positive things to say about their workspace than those who performed in the bottom quartile,” writes John Vogel, a contributor at US News. There are a number of ideas employers can implement to make their office spaces more comfortable and accommodating to their employees. Doing so shows employees that you care about their wellbeing and comfort at work, but also helps employees to be more productive and overall can prevent burnout and turnover. No two people function in an office in the same ways. In terms of preferences and personality, some employees function well in pristine working conditions, while others prefer to have clutter and personal items on their desk. Some thrive in shared, open spaces where they can collaborate with their peers, while others complete their best work in a more quiet, solitary environment. Given a choice, some prefer standing desks, others work best in a homey, comfortable environment, and others are perfectly content working at their desk. Employees are generally happier in a workplace environment where they have some degree of control over their physical space. At Facebook, for example, employees have the option to adjust their own desk based on their personal preference, and teams are able to use whichever workspace layout that will help them achieve their project’s goals. By giving their employees this kind of autonomy over their workplace environment, employees are more satisfied. All in all, it’s impossible to gauge what will work best in your organization without employee input. To improve employee morale and productivity, be sure to solicit ideas from your employees. You might be surprised to find that employees who are underperforming simply aren’t having their environmental needs met. Once you gauge what your employees require in order to be successful and content in the workplace, it’s important that you work to provide those things so they are able to make the most of their office space. 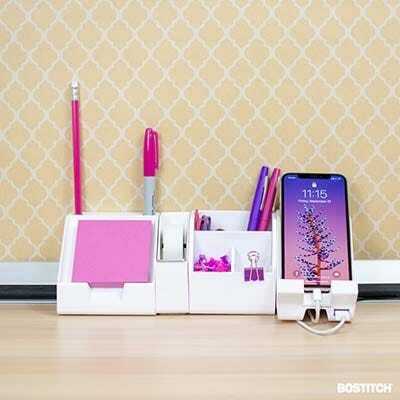 For some, the asks may be as simple as physical office supplies, such as desktop file organizers, cable management systems, desktop organizers, or other organizational tools. Depending on the company and the feedback you receive from your employees, more significant changes to the office space might be something worth investing in. You might find, for example, that some employees might perform better if they are given access to quiet areas, where they can better focus on important projects. Others might need a space where they can collaborate and problem solve with other employees without disrupting the rest of the office. Others still might just need a space where they can take a break, relax, and temporarily disengage from work. Making these changes might take time and resources, but overall, if you show your employees that you’re willing to prioritize their happiness and comfort, you’ll benefit from their increased productivity, and will likely experience less turnover as a result. For several years now, the open office design craze has completely upended the American workplace. While many have touted open office spaces as havens for innovation and change, others note that open office spaces are disruptive, increase rates of absenteeism, and result in much higher turnover rates. Additional research shows that productivity drops as much as 66 percent when employees are in a room that is chaotic or filled with background noise--distractions which are all too common in open workspaces. In essence, open office spaces prioritize collaboration at the expense of having places where people are able to focus. While open office floor plans may not be for ideal for everyone, there are ways that employers can design their offices to maximize the benefits of the open office model, without sacrificing employee productivity and happiness. One solution is to keep the general open office format while also providing spaces where workers can focus without interruption. Others have chosen to shift their office design by providing mixed and shared spaces that various employees can use for a number of tasks. There is no one right office plan that will function universally well for all companies. With input from employees, and a little bit of research, you can find a floor plan that works best for your needs, and the needs of your employees. Remote work has become extremely popular in recent years, both among employers and employees. Allowing remote work options allows employers to choose from a larger pool of talent, and employees receive a number of benefits, chief among them being the ability to work in their own space and achieve an optimal work/life balance. While it may seem counter-intuitive, releasing employees from a physical office space can increase their productivity. In fact, recent analysis by Forbes indicates that employees are actually more productive than their in office counterparts. Their analysis has been backed by a number of other studies. FlexJobs, an online service for professionals seeking flexible or telecommuting jobs, recently surveyed 2,600 employees and found that only 24 percent of employees reported accomplishing their best work in office. The other 76 percent reported that they excel nearly anywhere else. 50 percent reported doing their best work at home, 12 percent preferred a public space such as a coffee shop or a library, and the remaining 14 percent said they would function well in an office--but only outside business hours when there are fewer distractions. The reasons for this are many. Individuals cited that interruptions from coworkers, a distracting atmosphere, office politics, uncomfortable workspaces, and commuting stresses were all reasons they preferred to work outside of the office. This is just one argument for offering employees remote work options. "Companies should be very concerned when they hear that employees don't consider their normal workday in the office to be the best time or place to be productive on important work projects," FlexJobs founder Sara Sutton told Inc. "They should take a step back and evaluate whether their workspaces are really supporting productivity or hindering it. Why arbitrarily require people to work from somewhere that would make them less effective?" Regardless of your budget as a company, there are changes that you can implement to your physical workspace in order to help boost your employee satisfaction. Some offer tools to keep their employees organized, while others invest in spaces that help their employees collaborate or work quietly on their own. After all, investing in your employees happiness will only benefit your organization in the long run.